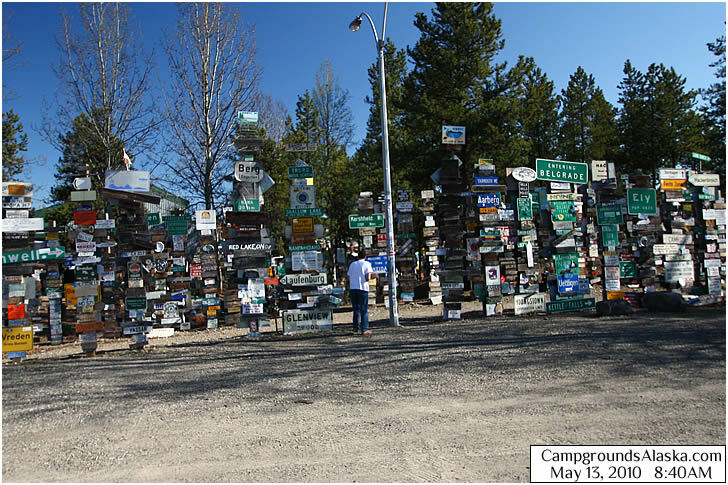 Located at milepost 635 on the Alaska Highway, Watson Lake is the first town in the Yukon that you reach after crossing the B.C. Yukon border. Known as the Gateway to the Yukon, Watson Lake has a long history in the construction and maintenence of the Alaska Highway. Signpost Village in the photo below was started by an American serviceman lonely for his hometown. Today there are some 72,000 signs hanging there and the number is still growing. Bring a sign and tell the world you were here. Gas prices drop considerably in the Yukon vs in Nothern B.C. Be sure to check your fuel and fill up here or better yet at Contact Creek where the prices are typically just a little bit better than in town. If you're heading sountbound, by fueling up in Contact Creek you will not need fuel again until you reach Fort Nelson just over 320 miles to the south.